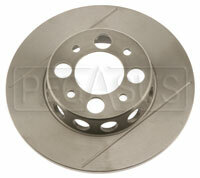 If you spend too much time trying to bed your brake pads, consider replacing your worn, grooved rotors! 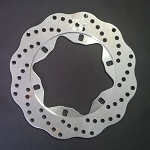 Our brake rotors are brand-new castings made in the USA exclusively for racing use. They are not repackaged street car rotors. This rotor is the same as our 3545-10, but grooved and lightened. Sold individually. This size fits Swift DB-1 FF and DB-3 FC with LD19 calipers, and older Van Diemen with 4-bolt wheels (non-centerlock). Note that some Swift DB-3 cars were fitted with larger calipers and should use the 10" OD Brake Rotors for Swift DB-3 with LD20 Calipers(Part No.40- 3545-30). This rotor can also replace AP/Lockheed rotor CP2222-9.